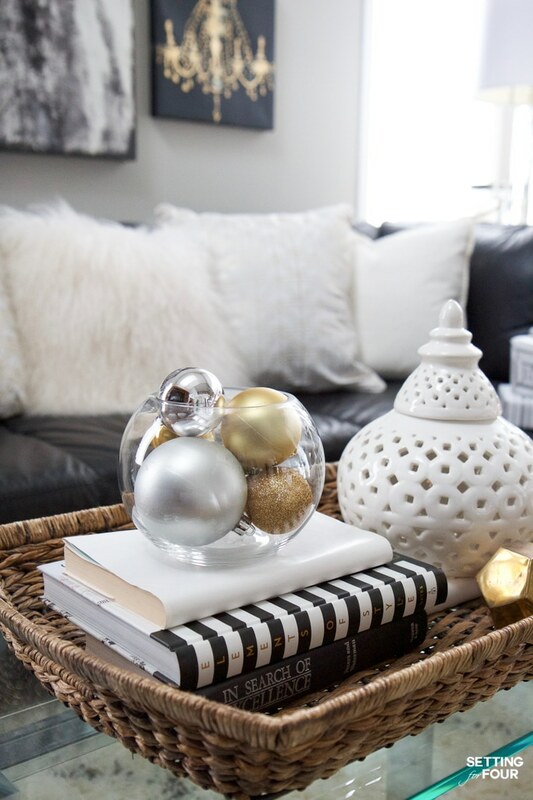 See my Glam Black, White and Gold Christmas Family Room Decor Ideas! 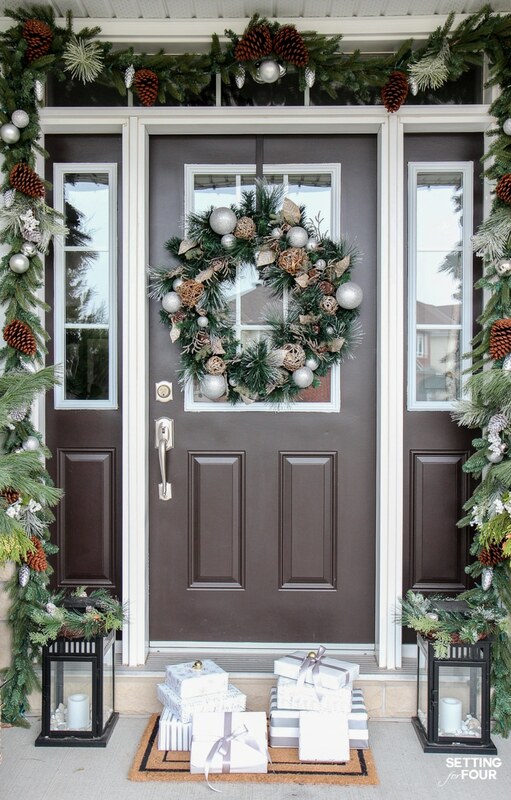 I kept my holiday decor simple this year – a mini flocked Christmas tree with gold and silver ornaments, some faux pine greenery and bowls of metallic Christmas balls keep this space looking light and bright but festive too! 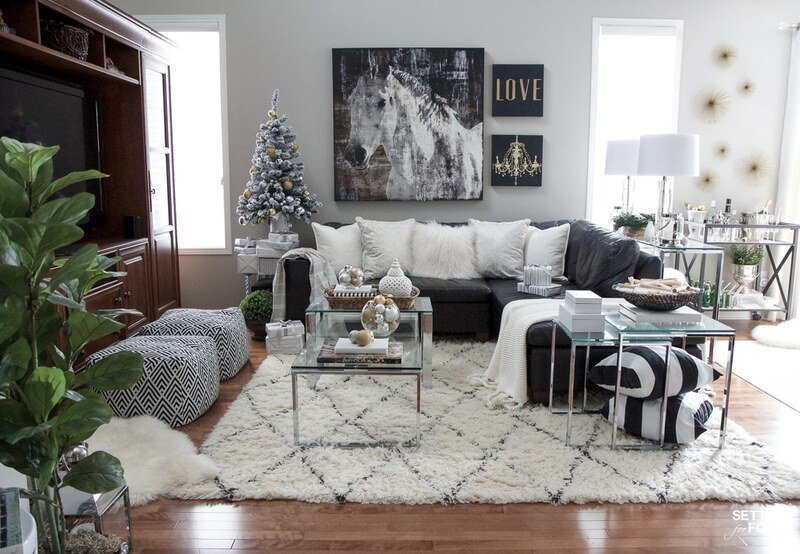 See my entire family room here including our leather sectional sofa, poufs, shag area rug, crystal table lamps, chunky knit throw blanket, black and white color palette, faux fur pillows, metallic wall art. 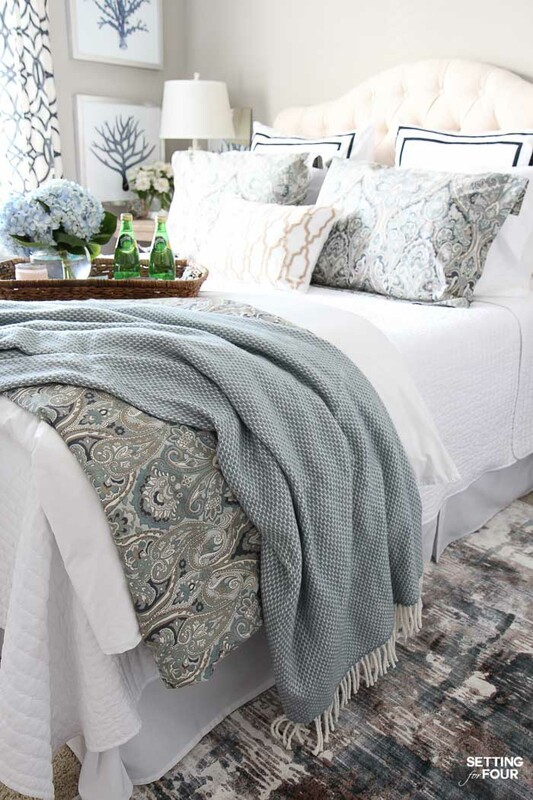 Shop my Family Room! Click on the images below and scroll using the arrows to shop the look! Here’s the view of our family room from our second story. We have vaulted ceilings in our living room which makes it a bright space! 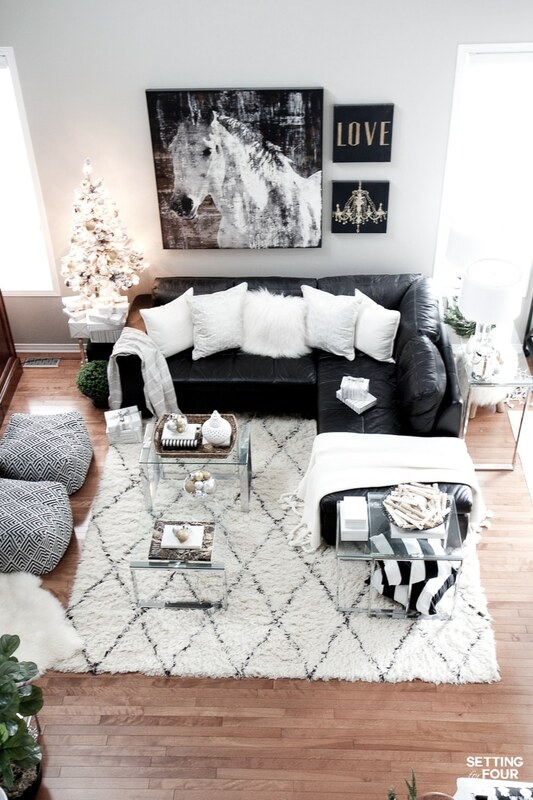 As you can see I love neutrals and love decorating with black and white with pops of metallics! 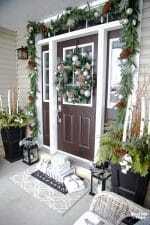 I kept our holiday decor in this space simple and muted. Glass bowls filled with silver and gold metallic ornaments are quick and easy to put together and make a beautiful display I think! 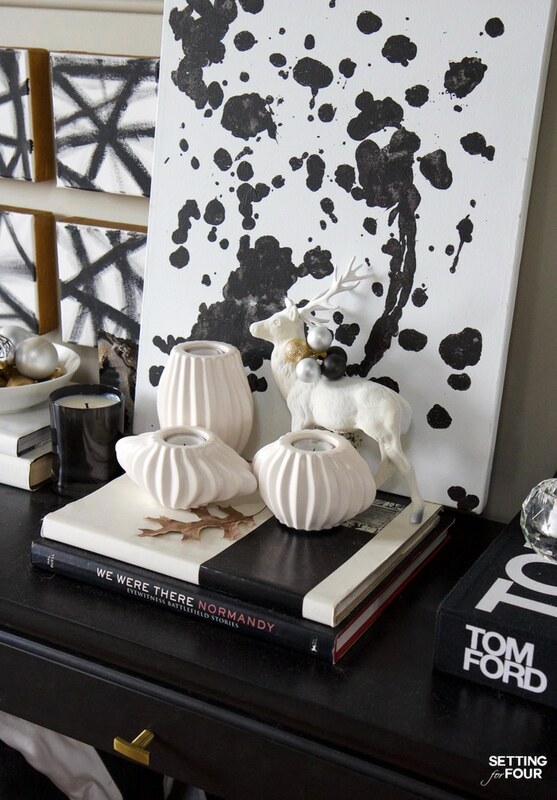 A small flocked Christmas tree is a perfect size to put on the end table. The little tree came with a stand but I just stuck it in my tall white vase filled with rice to hold it upright! 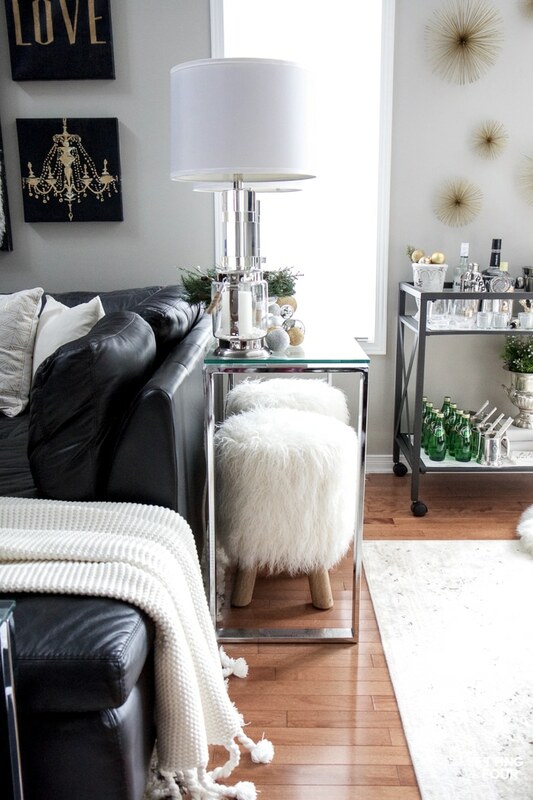 I gave our family room a cozy feel with the fur pillows. 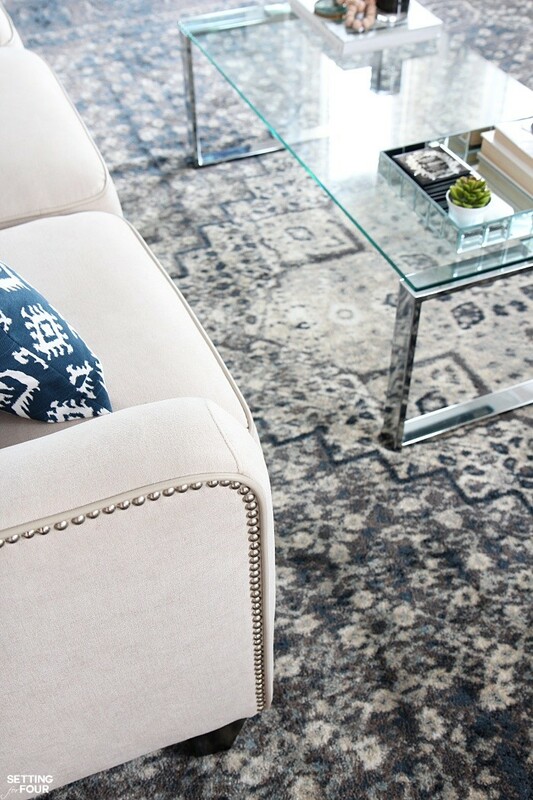 This Moroccan shag area rug is my favorite – I love the geometric print and texture! I think area rugs and lighting just ‘make’ a room don’t you! 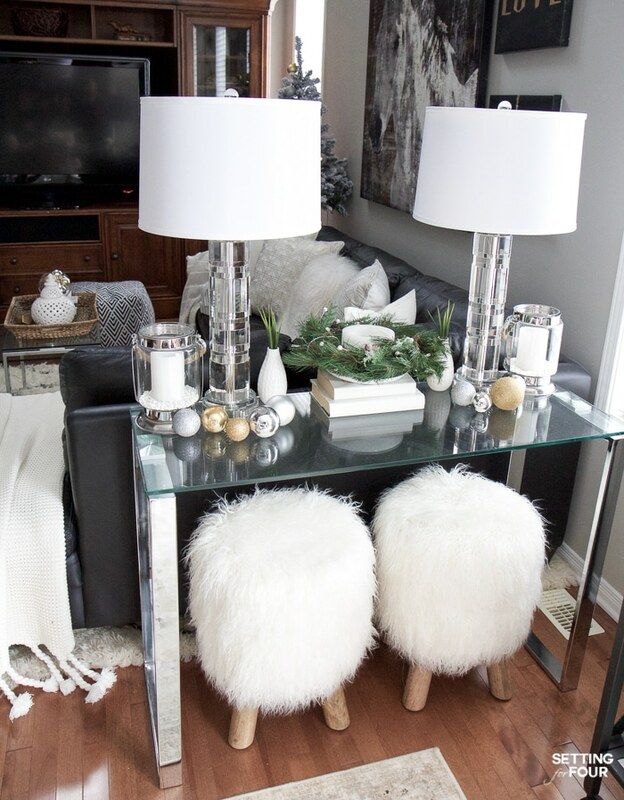 These mongolian fur stools are perfect for extra seating at our dining table or family room. Our family room is open concept and opens to the our dining room. I added this console table to divide the spaces and create zones. It’s a great place to add table lamps to add extra light at night too! A small pine wreath around a candle and a few balls displayed on the console table is the light holiday touch I added here. Click on the images below and scroll using the arrows to shop the look! 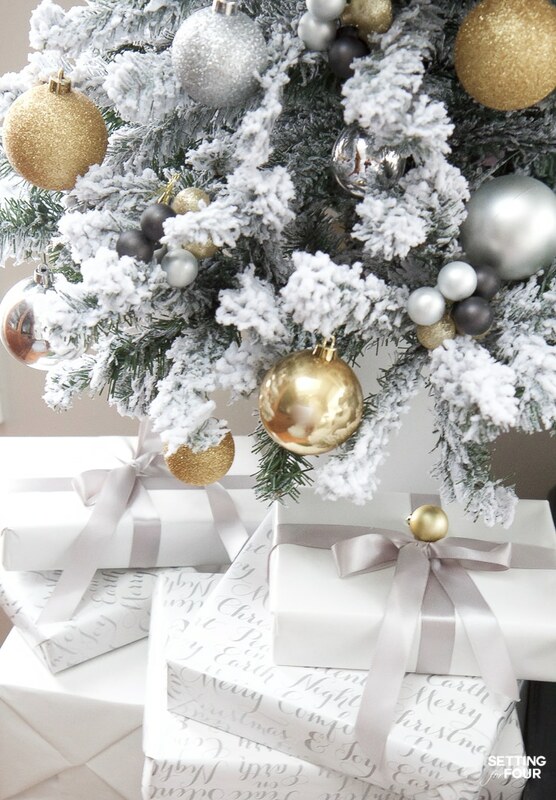 I’m completely obsessed with flocked trees! Here’s another view of our family room , bar cart and entertainment center. This is where we gather for family movie nights and cuddles on this incredibly cozy sectional! 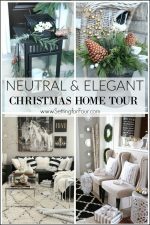 I hope you enjoyed seeing my Christmas Family Room Decor Ideas! I came across your blog ages ago but I am finally commenting on your living room. When I first saw the room I was totally in love with it. 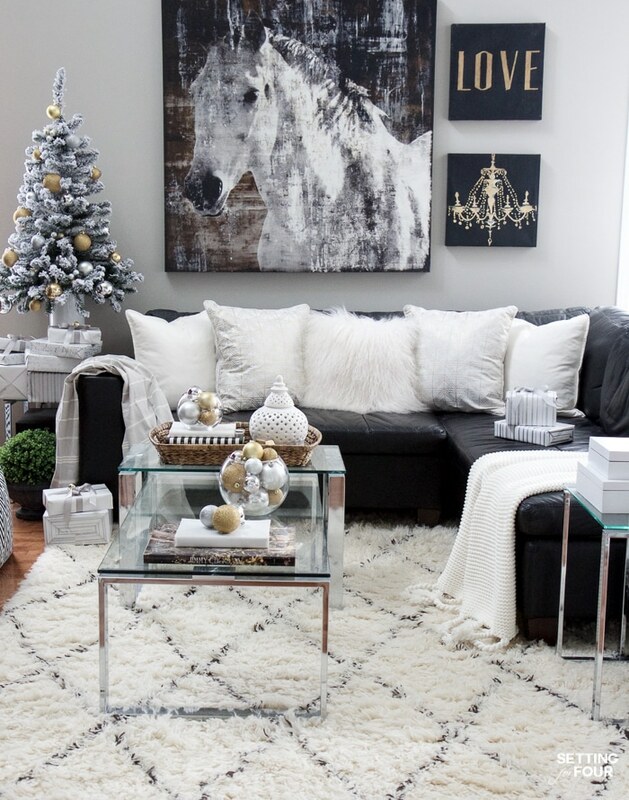 The horse picture with the gray, white and acrylic as well as the wood and metallics just kind of spoke to me. Since then, I have been working to gather what I need to complete my room and can’t wait for that day to come. I think I saw another room similar to yours but can’t remember where. Did you get your ideas from seeing something else? If so, do you recall where? Hi Shirley! 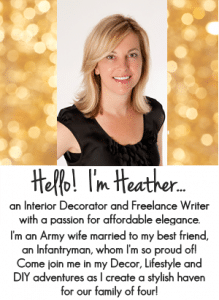 Thank you for the lovely compliments on my blog! 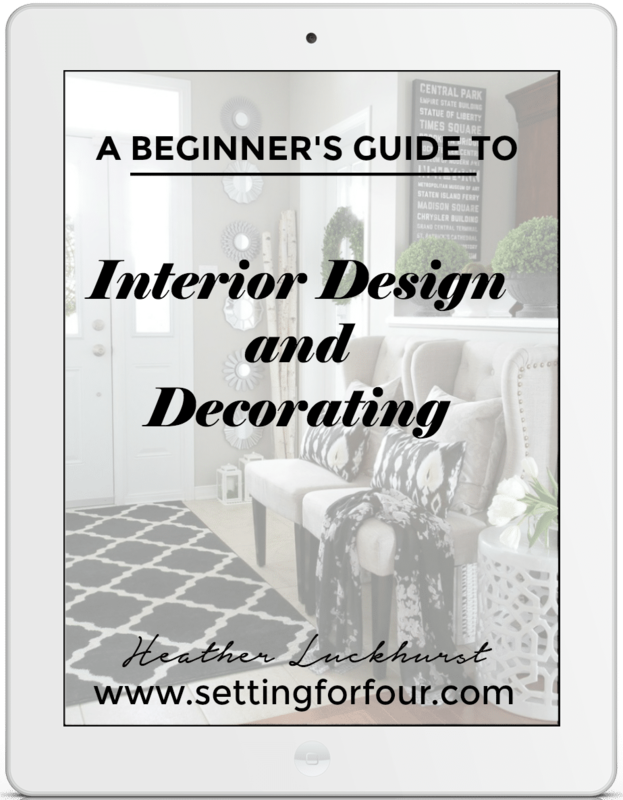 I didn’t get my decor ideas from anywhere else – they are all mine! 🙂 Have fun decorating your space!